I'm going to do this post in two parts: first the rant, then some possible solutions. At this point, I think I could safely make the assertion that I've become an aficionado of science fairs. I've been to Maker Faires, Robot Fests, Legopaloozas, and many science fairs, both big and small. I've also presented some quite popular demos at a few. There are many wonderful and amazing exhibits to be found at these events, but there are also experiences like the one I'm about to describe. To be fair, this sort of thing has probably been going on all along, but I've only been effected by it since I've been taking kids (i.e. protonerds) along with me. I was at a recent fair, doing the rounds with "the science kid", (as he often introduces himself) when we passed a Crystal Structures table. For their demo they provided the kids with gum drops and tooth picks. The students manning the booth helped to direct them in building a few well known crystal lattice structures. Of course, my little nerd wanted to make the most complex one. What followed was 45 minutes of me standing around while young mister laser-focus painstakingly assembled his structure. I could have wandered off and checked out some of the other exhibits, but the parental instinct kept telling me that if he finished and wandered off in search of me, it'd be a bad scene. So there I stood, passing the time by watching the tiny remote control airplanes circle overhead and the leaf-blower hovercraft do it's rounds. About 10 minutes after I'd lost the will to live, he managed to squirm his way through the crowd of other parents who were also waiting for their children to finish and proudly showed me his creation. "Look at the building I made!" He was, I felt, appropriately proud for having constructed something this complicated. It required no shortage of focus, hand-eye coordination and (given his fondness for all things involving sugar and gelatin) self control. So here's my gripe. Firstly, he didn't even know that what his was making was supposed to be a crystal structure. He didn't even know that the gum drops were supposed to be atoms. He likes atoms. He would have enjoyed learning that. There was obviously a breakdown in the educational process here. I've seen things like this before. 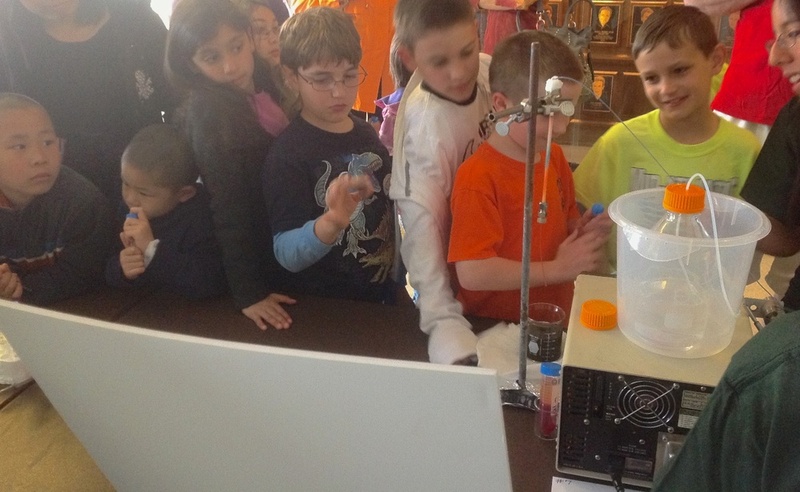 A group decides to put on a demo for a science fest. They want to to be dynamic and follow the educational theory that says that there are *many kinds of learners. * Their demos should be hands on and interactive. For those of you who've attended seminars on educational theory, have I hit all the right catch phrases? So they wrack their brains. What's more hands on and interactive than a craft? We'll have them make gumdrop towers, or maybe a cutting and pasting project. How about making a non-functional kite out of straws and paper? Or what's a better way to get kids excited about chemistry than making slime? Chemistry is magical, kids. It's made even more magical when we stare blankly when some impertinent kids wants to know why the borax turns glue into slime. I'm sure to their perspective, the demos are a complete success. Many kids spending much time being interacted with and dynamicized. To my perspective, it's an enormous time sink with limited educational or motivational benefit. It would be much better to have a relative quick demonstration of a particular principle. This concludes my rant. For my next post I'll talk about some science fair exhibits that I think hit the right points, and lest you think I'm down on crafts in general, my premiere example uses crafts to teach something.